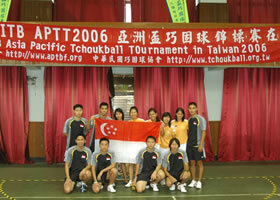 Singapore sent our first ever Men's and Women's national teams to participate in the 2nd Asia Pacific Tchoukball Tournament 2006 held in Kaohsiung, Taiwan. Up against world class competition from Taiwan, Macau, Hong Kong, our Singapore teams did us proud by playing their best. Results from the tournament can be viewed on the official FITB database here.